We had a room for four in the Albergo Cannon d'Oro **, Via Jean-Daniel Montanini, 28 (Tel: 577-443-21) . It was real fun, except for the noise at night: the cleaning truck plays loud drum on the paved street! And the Senese don't seem to go to sleep early. Before collapsing in our beds, we tasted a local specialty: tagliatelle ai porcini e panna. 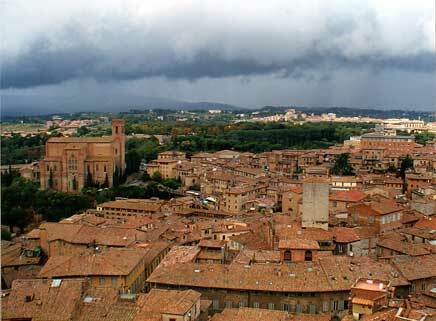 Despite the looming clouds, we went to wander in the tiny city, after breakfast at the Masgalano facing S. Domenico. The streets are charmingly medieval: narrow with tall houses on either side. We came by accident unto the Santuario Casa di Sta Catarina -- the sanctuary built over the house of St Catherine of Siena. It's a beautiful, peaceful little place, with moving relics. A church now replaces the kitchen, and all that remains of the latter is the hearth under the altar. The cell where Catherine prayed has been endowed with an anteroom covered with large frescoes recounting her life, like a life-sized comic strip. The disturbing detail is that her head is kept and exposed at S. Domenico. That's right: a few centuries ago Italian saints would be chopped up after their death so that their relics could be shared with other provinces. There's something I can't stomach. 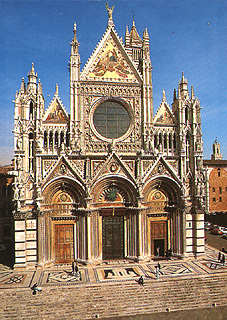 The Siena Cathedral is not to be missed -- not that it can be, as it is visible from almost anywhere in the old city. 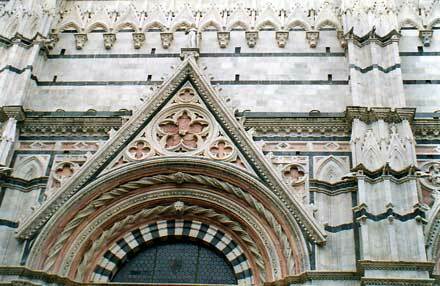 As an Italian Gothic church it is very interesting on several levels: it neutralizes Gothic verticality in the way it is bound to horizontality, and like practically all Italian churches, it lacks the flying buttresses -- Italian builders had the greatest contempt for these "appendages". A great part of it is of bare bricks: that is because the work on this ambitious extension was interrupted by the plague of 1340. Its outside is very intricate and brings the Christian and Classic Pagan traditions together: both among the facade sculpted figures and on the astounding marble floor, Evangelists and Christian symbols are pictured next to Greek philosophers and Sibyls. I learned that Sibyls were tolerated because they had announced the coming of Christ; the truth is that even during the Dark ages, the spirit of the Roman Empire was the source of inspiration in many domains (including Law and economy), and only the Roman pagan religion was rejected until the Renaissance. After the Cathedral our steps bore us to the Piazza del Campo of which I will tell more presently. 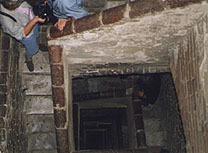 We went straight to the Palazzo Pubblico, or city council, with the intention of climbing to the top of its belltower. 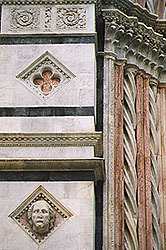 The latter is named Torre del Mangia, after its first bellringer: his nickname was Mangiaguadagni ("gain-eater") due to his extraordinary laziness. Despite its amusing name, the Torre is a stern adversary. 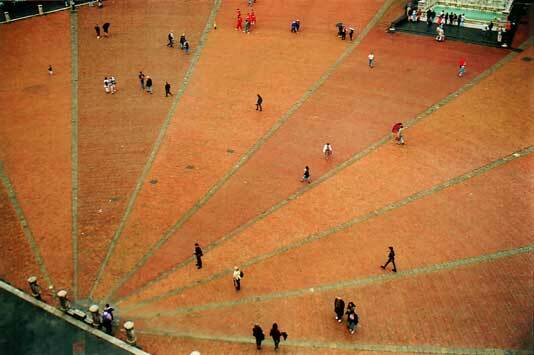 It is 102 meters high with 505 steps from the ground to the bell platform. 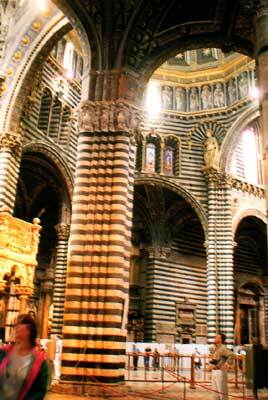 It was erected in 1334, meaning the steps and staircase manifest no notion of ergonomics. 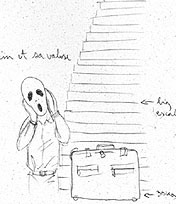 The climb is a nightmare because there is just enough room for one person, and yet there are people coming down while you're going up... 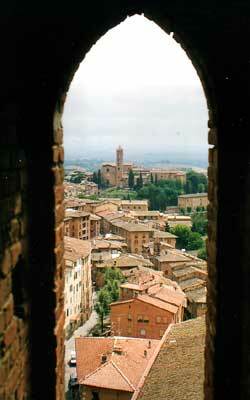 However, the view from up there is truly marvellous, a bird's-eye view of Tuscany. We had just enough time to take pictures from the highest attainable level before thunder rolled and rain started to pour... and we had to run down the terrible steps. 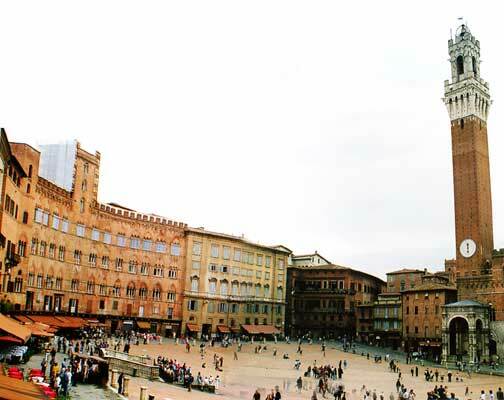 Let me return to the Piazza del Campo. Any book on Siena should begin with this square, for it is the heartbeat of the city, and anything you might want to tell about Siena can easily flow from it and the event that unfolds there yearly. The Piazza del Campo is shaped like a shell, the 9 sectors of which evoke the council of Nine; the latter governed the city during the Middle-ages and brought about its greatest prosperity. 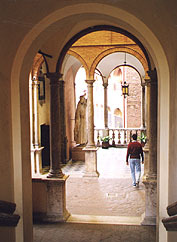 It is not flat, but curved downwards and gently sloping towards its "source", the Palazzo Pubblico, in such a way that the general reaction is to sit down on its red-bricks pavement. A little jewel of a square, very animated thanks to the restaurants and shops around it, and cozy. In one of the streets nearby stands the Trattoria del Torre, our best memory of an Italian restaurant, with its familial mood, french-speaking cook and fresh pasta. But back to the Campo. Once a year, the Campo is the theater of the great Palio race, an event so important to the Sienese that the city vibrates with it all year long. 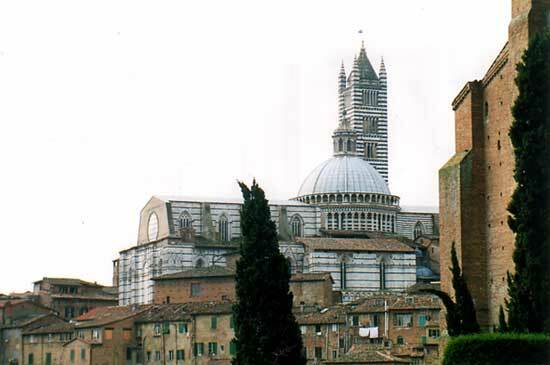 Here's an article on Siena's Contrade and the Palio. A vendetta was raging between the Tolomei and Salimbeni families. To end the fights, the latter invited the Tolomei to a banquet of reconciliation. Near each Salimbeni was seated a Tolomei. When the doyen of the Salimbeni rose and said: "Adesso, figli miei, a ciascuno il suo ("Now my sons, to each his own")", all the Salimbeni stabbed their neighbour... Their tombs are by the convent of S. Francesco.